"Being 74 years old and having started at 14 years old, I can say that I have 60 years of woodworking experience. Although I did some commission work on a small scale to pay for the tools, I have been and remain a hobbyist. I did a lot of furniture for my three children and 7 grandchildren. A lot of people think that it is insane to have so many tools and not make real money with them. I am a self-taught woodworker. When I started in 1950, there were only three magazines (Popular Science, Popular Mechanics, and Mechanics Illustrated). Those magazines ran only a small section on woodworking. 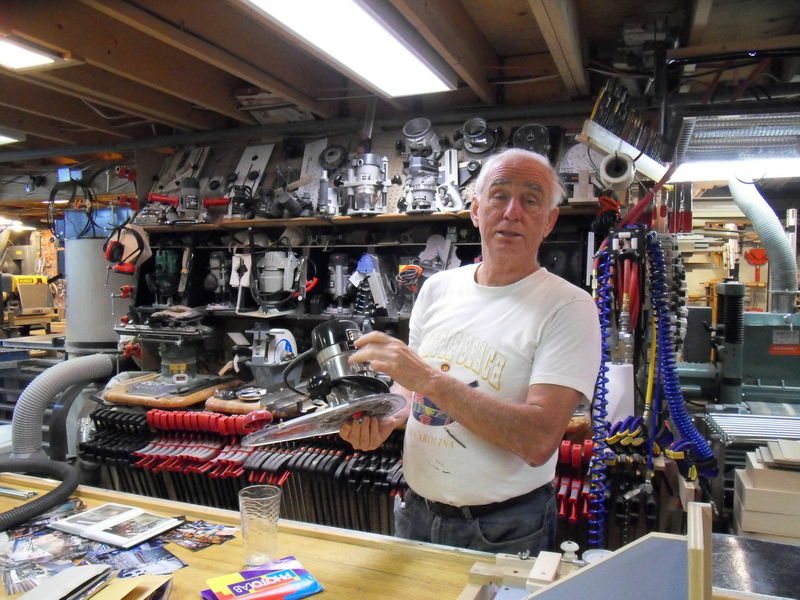 Nowadays there are over a dozen or so good magazines devoted strictly to woodworking. Of course their articles are repetitive and their assessment of tools sometimes less than honest (lets not insult the advertisers). I have started writing for Canadian Woodworking and Home Improvement and I find it very interesting and challenging to try to explain various techniques. In 1950, at the age of 14, I entered a contest in Mechanics Illustrated for my first piece of furniture (a coffee table for my mother). The competition could not have been very strong because I won the second prize. 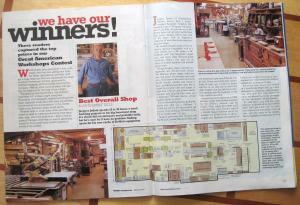 For the next 50 years, I never entered another contest until March 2002 when I participated in the Wood Magazine / DeWalt contest for the best shop in North America. 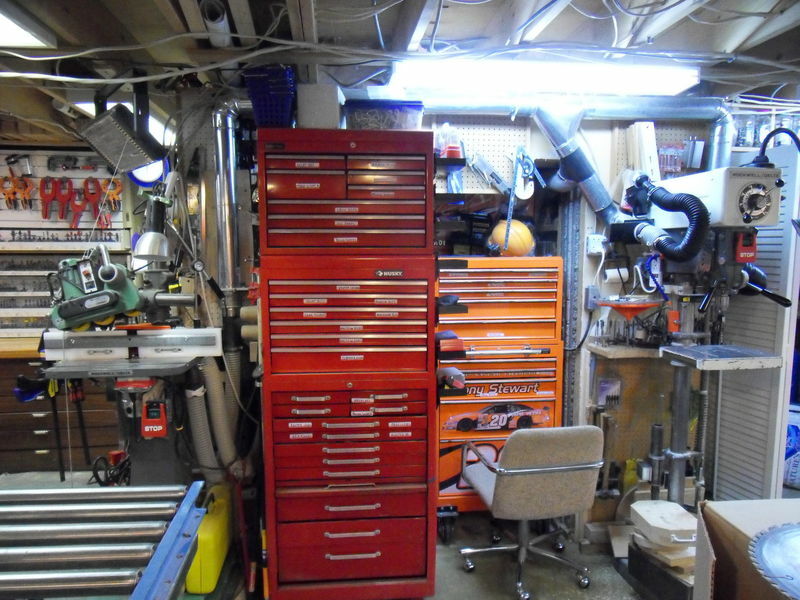 I won the prize which was $3000 of DeWalt tools." All the workshop images in this article can be enalarged by clicking on them. The front workbench is raised and lowered with scissor tables made in China. This means that they are not expensive but the pistons do not hold for more than 10 minutes. The solution is to block them at the desired height. It can be lowered to 11" or raised to 36 ". Very convenient when working on tall pieces of furniture or with grandchildren. 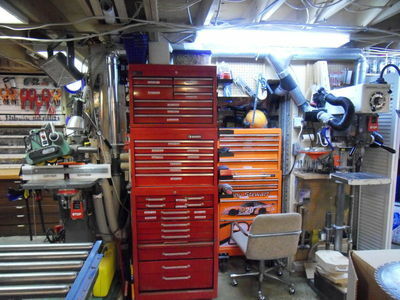 The back workbench is 4.5 feet by 11 feet. and made of 3" thick butcher block style red oak. There are 8 electrical outlets around the benches as well as 10 vacuum outlets connected to the bench's own vacuum. I have been in this shop 25 years. 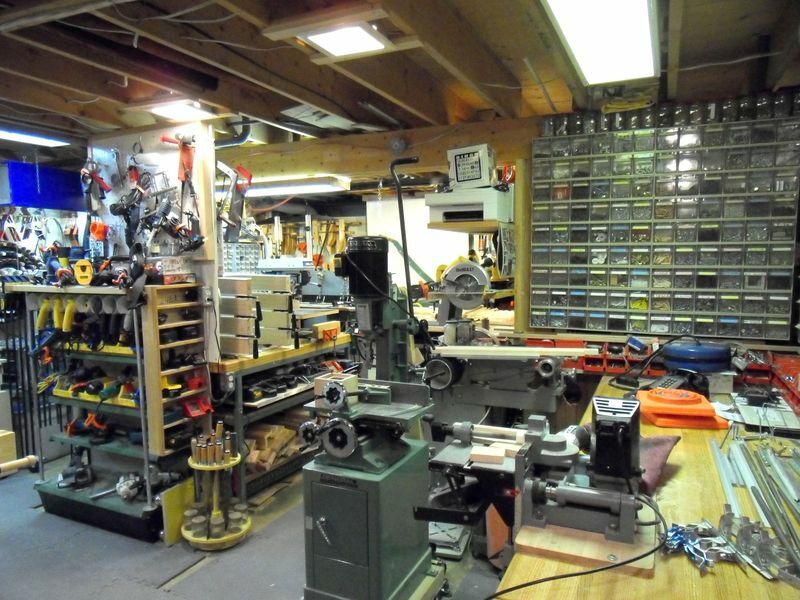 The first few years, I only had the single workbench against the left wall (without the fridge and router bits cabinets).. I thought keeping the center of the space opened for assembling, would work well. 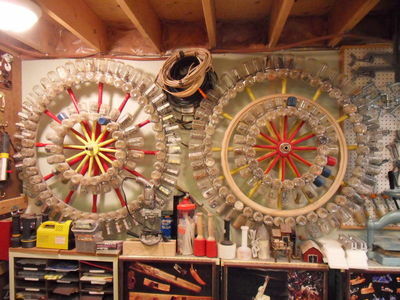 The problem was that I could not work all around the workbench, a big handicap when gluing large pieces. 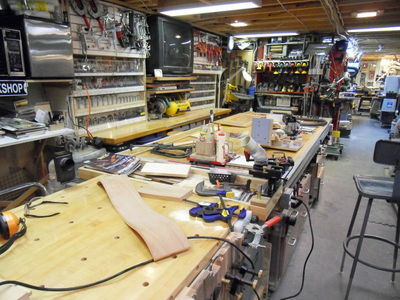 When I obtained the router cabinets, I decided to sacrifice that center space with the gigantic double benches. Although reducing the assembling space is somewhat of a problem now, being able to work around the bench is much more desirable. 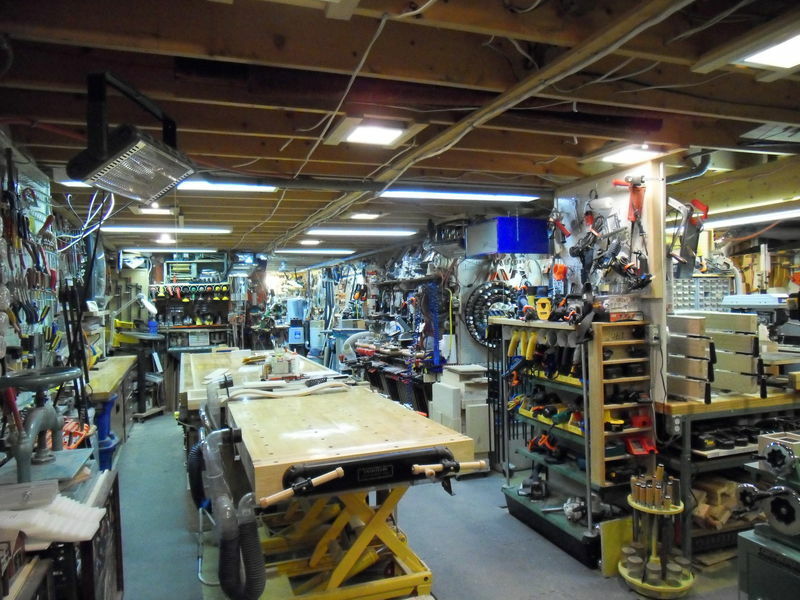 This is a view as you enter the shop. The General Int. mortiser is on a caster base to either get it out of the way or when long boards require space. 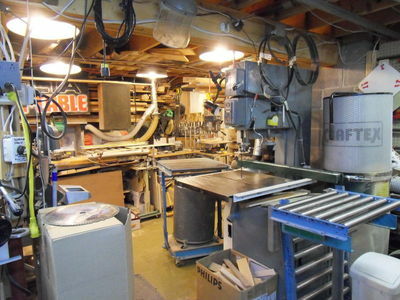 The workbench is the same heavy oak top found all over the shop, with a stationary biscuit machine in the forefront. That machine is used very often because it is very accurate and quick on small pieces. 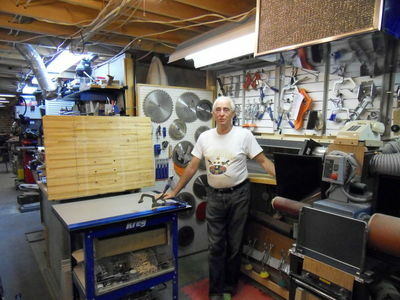 I use portable biscuit planer on large plywood pieces. 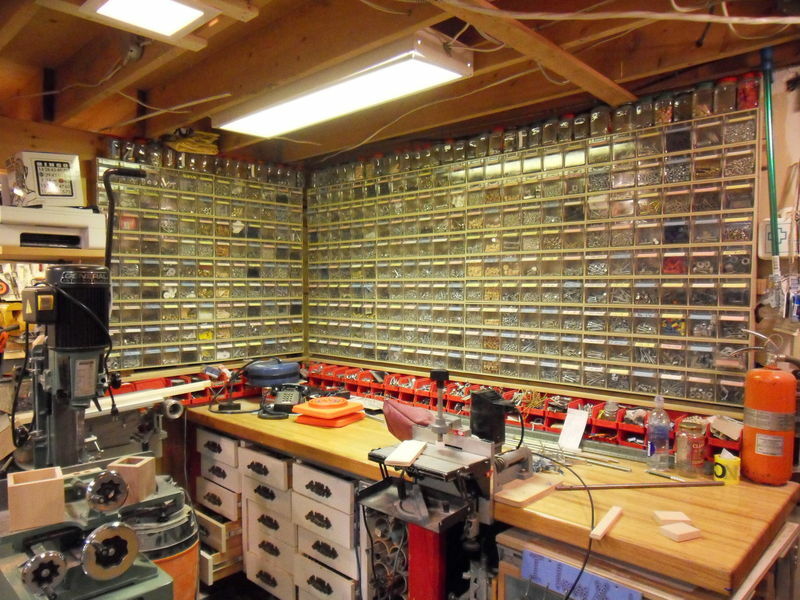 Those drawers were used to store heavy automotive sockets at The Home Depot. Customers tended to break the drawers when retrieving them. When they changed to a new system of hooks I bought the 336 drawers for $5. The frontal clamp on the biscuit jointer can be used horizontally or vertically. The table can be inclined. The only bad aspect of this machine is that the motor is pushed in with a pedal on the floor. Because the blade has to come out the right distance to make the groove deep enough, the pedal does not always do so. The correction was to install a lever with a cam at the back to guarantee a full trajectory. (Not shown on photo, done after the photo was taken). This stand stores all the small drills and specialized portable tools. 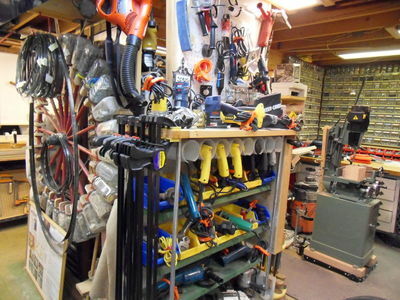 The 4" ABS pipe sections provide good storage for this type of tools. A hook on the back wall of the stand helps keep the cords from dangling. The wagon wheel is a real one. The bigger jars allow bigger items but you have to make sure to balance the content, otherwise it will spin for a while. This is an old Craftsman router when tools were made of metal not plastic. Routers have evolved during the last 50 years. The router in my hands has a most dangerous unprotected start switch. 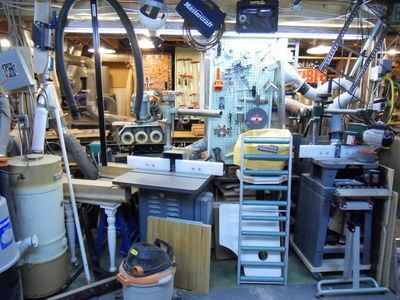 For the first 30 years, I had only one l.5 hp Rockwell router (made of metal) which I still have installed in a pin router table. Then, there was an explosion of new designs which made routers much more efficient and interesting to use for all kinds of techniques and joints. While working for Home Depot and then Porter Cable, I had many opportunities to buy routers at a price I could not resist. Most serious woodworkers have three or four routers. I have a few more. The joke is that I do not like to change bits. The grinders and strip sanders are on pull out revolving tables for easier access. This is a view of one quadrant of the shop. 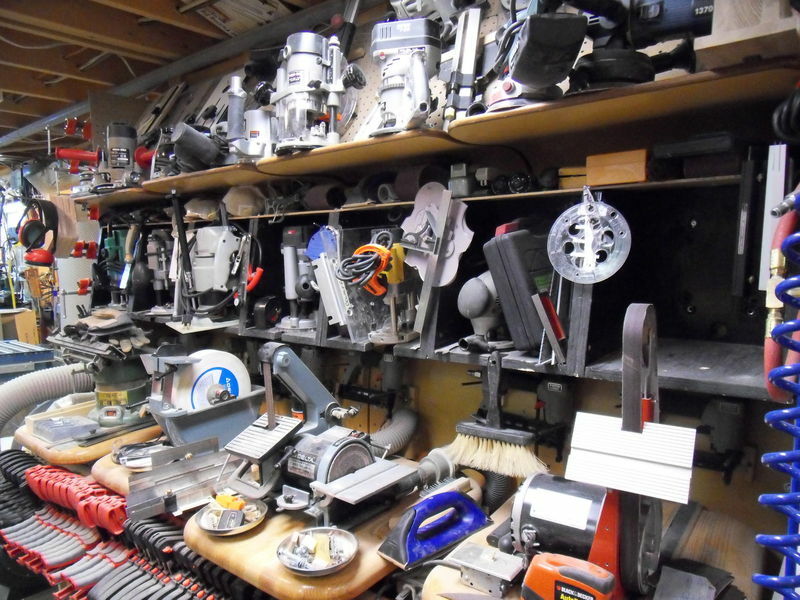 It is cluttered, but with casters on most mid-size machines, it is still relatively efficient use of space. 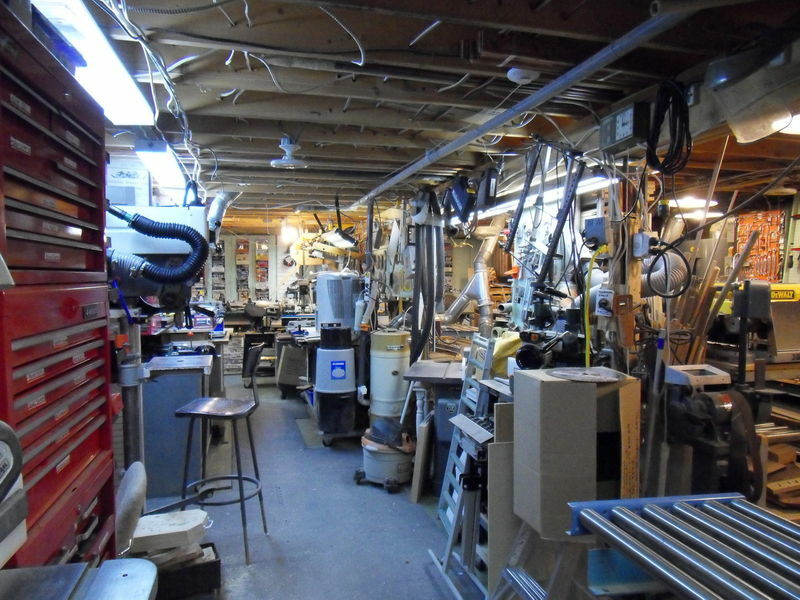 Being a basement shop, the rent is free, water and electricity are easily available, but there is no sun, it is damp in the summer and the ceiling is only at 92 ". I will eventually finish the ceiling to brighten up the shop but I hesitate because I use the joists as a storage area. The shop is a rectangle of 26'0" x 70'0". The length means a lot of walking. If I were to build a customized shop, I would certainly go for a more square area. The big Rockwell shaper on the left was bought in l970 for about $1500.00. With inflation taken into account, a new one of that quality and size should cost $5000.00 today. Instead you can get one for less than $1500.00. The point is tools and machinery are now cheaper than ever because of better manufacturing methods and competition; and to a certain extent quality has gone down. On the right of the photo is a smaller Delta shaper which I bought for a song from someone who had taken it in for an unpaid debt. It is very useful for quick set ups. The larger shaper is at an angle so that I can pass molding that are 15 feet long with the help of the feeder shown in the background. That feeder can swing back and be used on the 8" jointer behind the shaper. The 20" Delta band saw shown in this photo is the workhorse of the shop. I use it every day. I prefer, by far, to rip on the band saw rather than on the table saw. 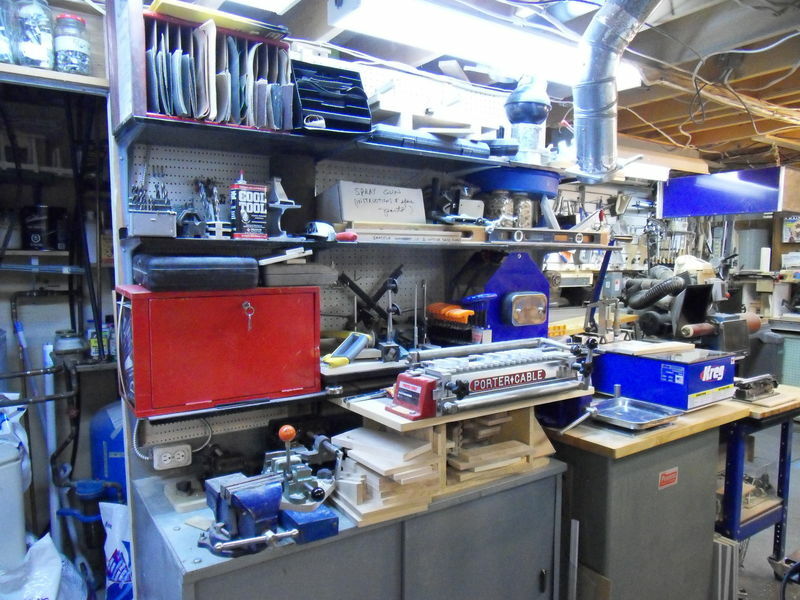 I find it safer, easier and I have more space and access on the band saw because of the two sets of rollers which are height adjustable and on casters for use with other machines. The band saw has its own vacuum system. Although this saw is 45 years old, it still works like new. I have added a better fence and am now in the process of changing the guides to a Carter bearing system. The main drill press. 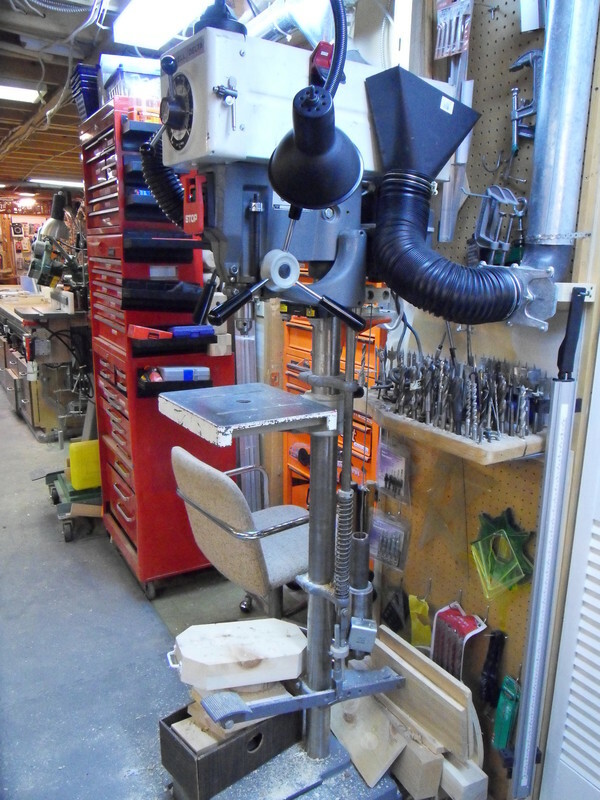 A feature of this drill press is the foot pedal that can be used to plunge the drill, for when you need both hands to hold the work piece. The drill press has a 6" long stroke, with no play. There is no crank to raise or lower the table so I installed a counterweight on a pulley system to counter the weight of the table. 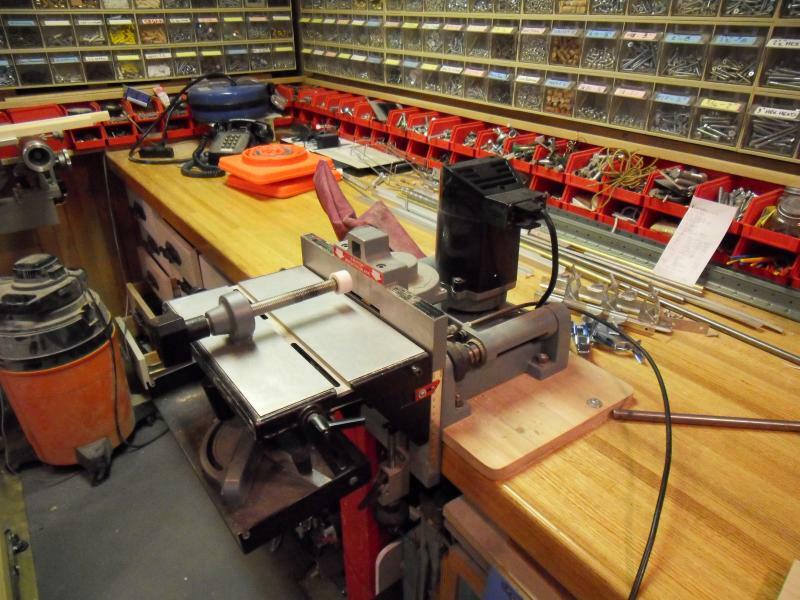 This drill press also has a variable speed clutch and an after market laser system. There are 2 vacuum hoses (one on each side). The only thing wrong with this 40 years old drill press is the table. Manufacturers have lately greatly improved the tables. I have made two accessory tables with t-slots and special clamps. I also use a couple of fixtures with the new MAG (magnets) for quickly attaching vises to the table. 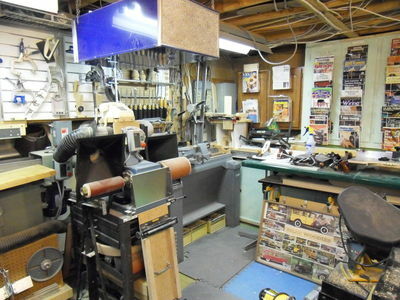 On the left side is a pin router table on a pedestal and a small feeder. The red and orange cabinets are useful for quick retrieval of bits, gadgets and small jigs, etc. The chair is used to watch TV at night. In this photo, the main machine is a double shaft balloon sander (3" and 6"). They produce a lot of dust which is captured by the large scoops behind connected to a powerful vacuum. 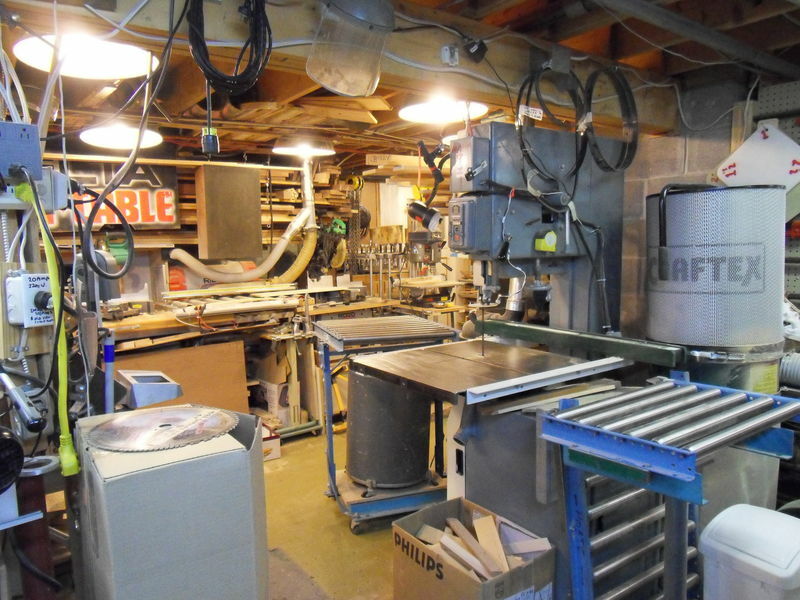 On the right is a 12" Delta lathe with two duplicators. The American made one is expensive and very good. The Chinese one is cheap but almost useless. I had to do extensive changes just to make it work. On the left side (barely seen) is a vertical edge sander (6" by 202"). This is one of the most often used machines. The Kreg table is very efficient when making cabinet frames. I have been using Kreg jigs for the past 20 years and have always found their products very ingenious and of excellent quality. There is an air exchanger on the ceiling (right hand side of photo) because the belt sander and the lathe produce a lot of dust even though they are connected to efficient vacuum systems.